Indonesia's Bandung is not called "Paris of Java" for nothing. Bandung goes by the moniker of the “Paris of Java”, and this quaint city is indeed just as charming as its European counterpart in numerous ways. From mythical misty volcanoes, cool climate, a denim-dedicated shopping street to hectares of luscious tea plantations, this is a booming metropolis that screams unconventional adventures. Whilst wrapped in all those thick jacket layers atop the majestic mountains and around the chilly highlands, you might actually forget that you’re still in South East Asia! And to start your off-the-beaten-path adventure, book your holiday with Expedia to enjoy an additional S$40 off Bandung flight+hotel packages, or an additional 10% off hotels. SilkAir flies from Singapore to Bandung 5 times weekly, giving you plenty of options to plan your schedule. 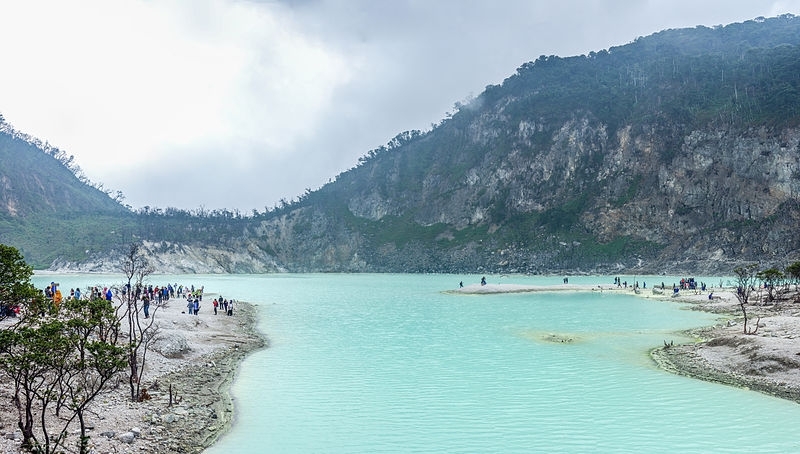 Kawah Putih, also known as White Crater, is one place that you can’t miss out on when visiting Bandung. A visit to Kawah Putih, with its soft white sand and crystal clear waters, will make you feel as if you’re transported to a magical land. 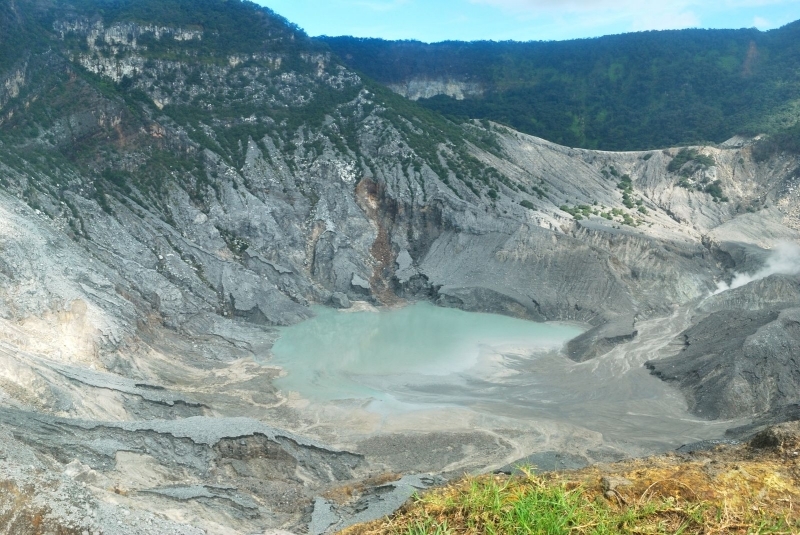 The lake was actually formed after Mount Patuha erupted and created a crater. The colour of the water actually changes according to the weather conditions in the area, so one visit here might not even be enough to witness the truly mesmerising beauty of Kawah Putih. Cost: The entrance fee is about IDR 50,000 (~S$5) per person with an additional IDR 6,000 (~S$0.60) for car entrance. Welcome to Ciwidey Valley Resort, where they have combined hot spring pools and a water park into one awesome resort! With something for everyone, adults and kids alike will definitely have a blast here. The little ones, brimming with energy, usually find it too boring to just lay still in the water without doing anything. The water slides here will definitely catch their eye, and make them go splashing into the water over and over again. While the slides keep the kids busy, the adults can reward themselves by soaking in the pools and letting the natural hot spring water work their magic. Finally time to relax without any distractions! Cost: Entrance fee to the park for non-staying visitors is at IDR 20,000 (~S$2) per person, inclusive of a complimentary soft drink. An addition fee of IDR 50,000 (~S$5) will be charged per person for use of the pools. For those who are interested in staying here, the resort has a variety of accommodation options for you to choose from, starting from IDR 850,000 (~S$86) a night. THIS is absolute fun for the entire family. If you’ve been struggling to find a destination that will suit everyone, look no further. Book your holiday to Bandung with Expedia and enjoy an additional S$40 off flight+hotel packages, a.k.a. more savings for everyone! With over 40 factory outlets such as Rumah Mode, Heritage and The Secret, you’ll be able to find your favourite brands (hello Marc Jacobs, Nike, Zara, Armani and Gap) all at an absolute steal! The only problem you’ll face here is having to decide what you actually need, versus what you want. With each factory outlet spanning several floors and housing an array of restaurants and cafes, you’re in for a very, very satisfying shopping treat. This, is retail therapy at its finest. 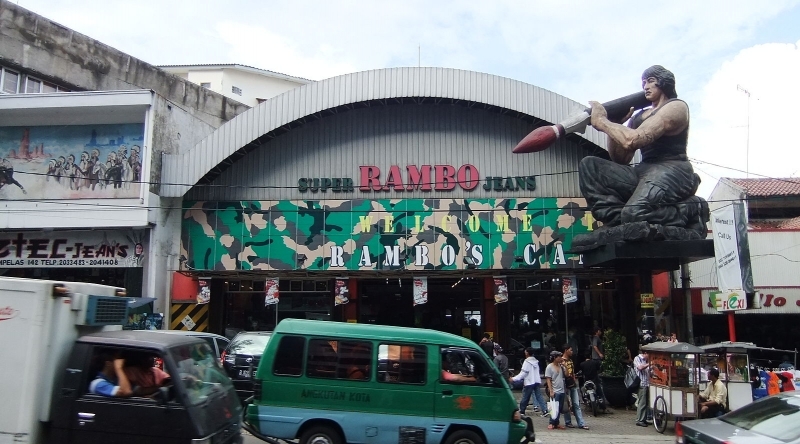 An alternative shopping area worth exploring would be Cihampelas and Dago Street, where you can nab superb bargains on garments (especially denim wear) from local designers. With most products ranging from just S$1 to S$5, you will be in for a giant shopping spree (again). If you are just going for locally-produced wares, your best bet would be Pasar Baru, which is a giant bazaar of handbags, textiles, shoes, carpets, bedspreads and other products. Need we say more? In Bandung, the normal cafés and restaurants just don’t cut it. Here, eating isn’t just a means of sustenance; whether you’re hungry or not, these three super cool dining establishments are guaranteed to give you a dining experience like no other. 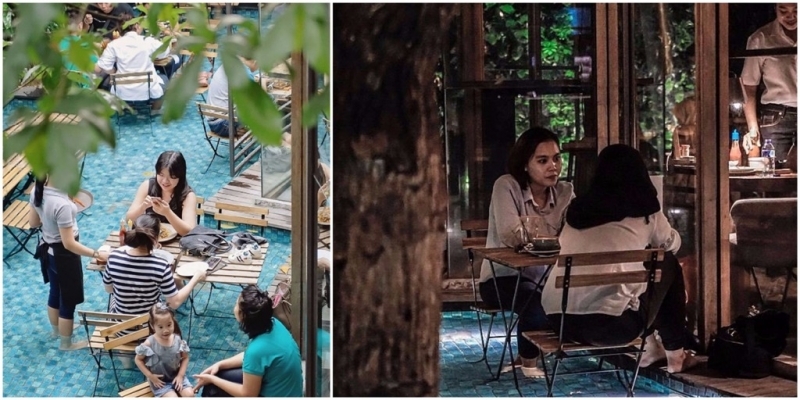 This café in Bandung brings ‘dining by the pool’ to a whole new level, allowing you to (quite literally) dine within the pool itself. Uniquely structured, the One Eighty Coffee & Music establishment boasts a lush vertical garden, a cosy interior, and – would you believe it – a pool with tables in it. Visit on a swelteringly hot afternoon and gain some respite from the heat, as you dig into a wide variety of food whilst submerging your feet. Once night falls, the pool is illuminated with a soft light, transforming the compound into a magical fairyland. Serving up a range of dishes from Western to Thai, priced between IDR 24,000 to IDR 100,000 (~S$2.40 to S$10.10), your stomachs will not only be the ones who’ll be leaving the place happy – your wallets will too! If you’re thirsty, the café has coffee, tea and even cocktails priced at IDR 18,000 to IDR 35,000 (S$2 to S$3.50). Desserts like S’more Lemon Cheese Cake (IDR 35,000 / ~S$3.50) and Coffee Ice Cream Cake (IDR 38,000 / ~S$3.80) are also available. Tucked high up in the mountains, Lereng Anteng Restaurant offers a breath of fresh air far away from the city’s hustle and bustle. The restaurant offers a cliff-side retreat complete with spectacular views of Bandung, fantastic coffee (we heard that Vietnamese drip coffee is available on the premises as well), as well as delectable Indonesian fare that will set you back about IDR 15,000 to IDR 30,000 (S$1.50 to S$3). Some items that can be found on their menu include Nasi Ayam Tulang Lunak (soft bone chicken rice), Sampeu Goreng (Indonesian fried cassava) and Roti Bakar (grilled toast). There are beanbags and tents available for those who wish to lounge around and enjoy the crisp mountain air. You’ll easily be able to spend the whole day here, so come prepared with a book or some games to play with your dining companions. Resembling a majestic villa of sorts, the Kampung Daun Café promises no less. Located within a nature reserve, the café offers diners the chance to escape into a world of serenity. If you’re looking to have a private dinner, you’d be delighted to find that the restaurant actually consists of individual dining huts – with each hut located some distance from each other. Waiters are summoned by hitting bamboo against each other, and your food will be delivered right to your tent. At Kampung Daun Café, you can pick from a selection of local Indonesian cuisine or Western cuisine. If you can’t decide, why not have a little of both? Feast on a margherita pizza (IDR 38,500 / ~S$3.90) or a plate or Bebek Keremes (fried marinated duck with steamed rice and sambal; IDR 97,500 / ~S$9.90), and you’ll surely be left wanting more! And how can we not mention the Sundanese culture? As Bandung represents the major urban centre of West Java, it’s fundamentally the epicentre of classic Sundanese cuisine and culture. With the Sundanese forming West Java’s vast majority, the tantalising cuisines and legendary street foods (banana fritters for S$1.50, anyone?) here reflect their fondness for fresh raw vegetables. Aside from that, the dishes have very distinct tastes ranging from savoury and sweet to hot and spicy. 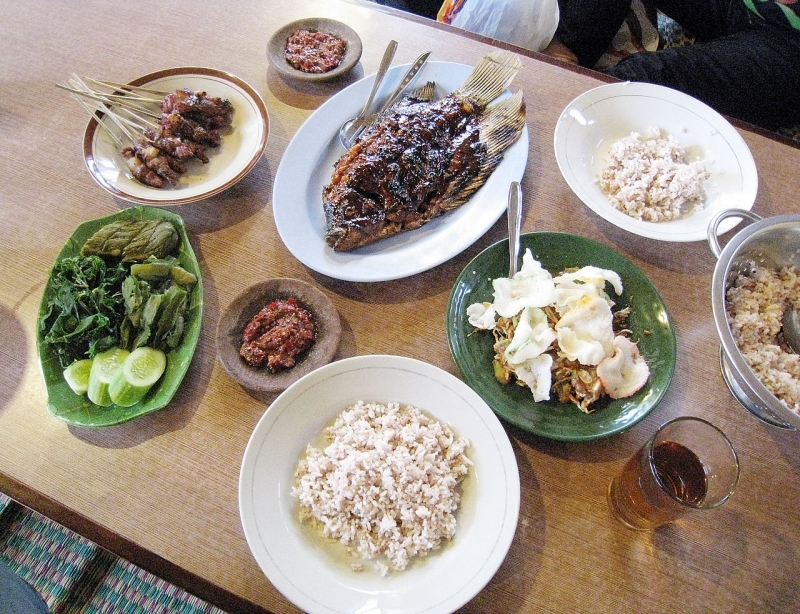 Some of the more well-known (read: must-try) delicacies pictured above include Nasi Timbel (banana-leaf steamed rice with side dishes), Gurame Bakar (charcoal grilled fish), Karedok (vegetable salad with peanut sauce) and Lalab (raw vegetable salad). Other absolutely delicious dishes include Sayur Asem (a tamarind, vegetable soup) and Soto Bandung (noodles in beef broth). To top it off, dip some crackers into authentic Indonesian sambal (chilli sauce), and sample some Lembang fresh milk to wash it all down. Besides the hearty local fare, take this opportunity to immerse yourself in ethnic Sundanese culture. The angklung instrument is a huge part of this fascinating culture, and the distinct, light wooden sound comes together harmoniously to produce incredible melodies. 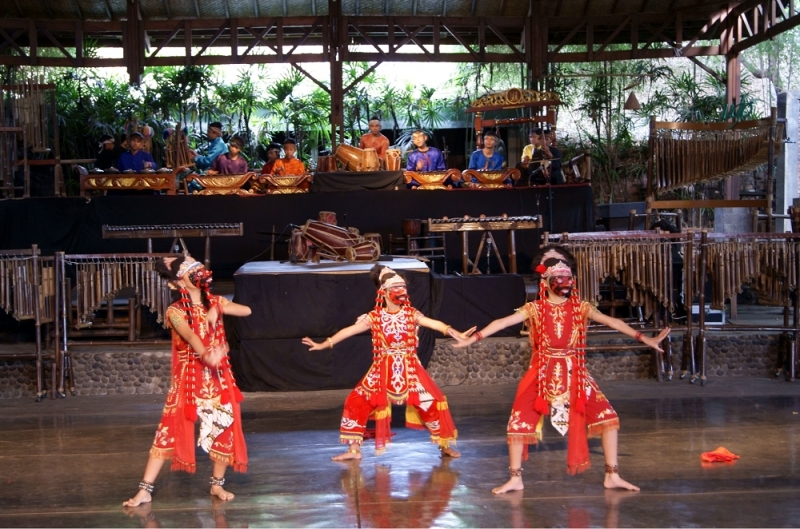 In Bandung, you can pay homage to the intrinsic Sundanese culture by paying a visit to Saung Angklung Udjo, a thriving music school where you can witness the daily showcases of talented musicians. Concerted efforts have been made by the owners, Mr Udjo Nalagena and his wife since 1966, to conserve this vital component of the arts and music scene. Cost: Ticket prices range from IDR 60,000 to IDR 100,000 (S$6 to S$10.10), depending on whether you visit on a weekday or a weekend. You can also choose to participate in the bamboo instrument workshop, which will cost you about IDR 45,000 (~S$4.55) per person. 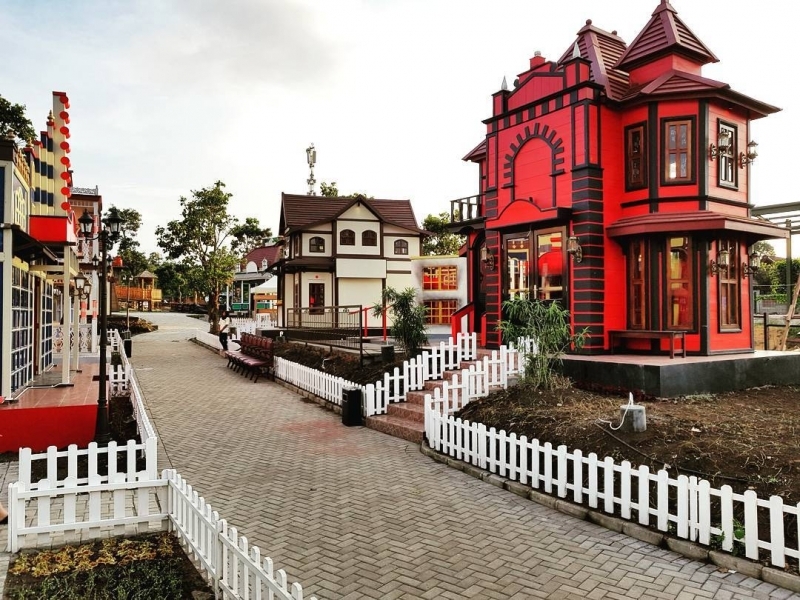 Kota Mini Lembang is one of Bandung’s newest tourist attractions. Recently opened in June this year, it is a mini European town where many activities await. Lined with elaborate European-styled architecture, you’ll definitely be taking loads of photos along the streets. From a cooking school and cafés to even a teddy bear house, each building is incredibly unique. Cost: To enter this mini European town, you will be charged an entrance fee of IDR 15,000 (~S$1.50) per person. You may also want to consider buying the “Passport Program” ticket (IDR 150,000 / ~S$15.20), which will grant you free access to 10 different attractions or houses. Let the kids play pretend with the many “job opportunities” here. Whether they dream of being firefighters, police officers or chefs, Kota Mini Lembang is where they can act out their dreams. 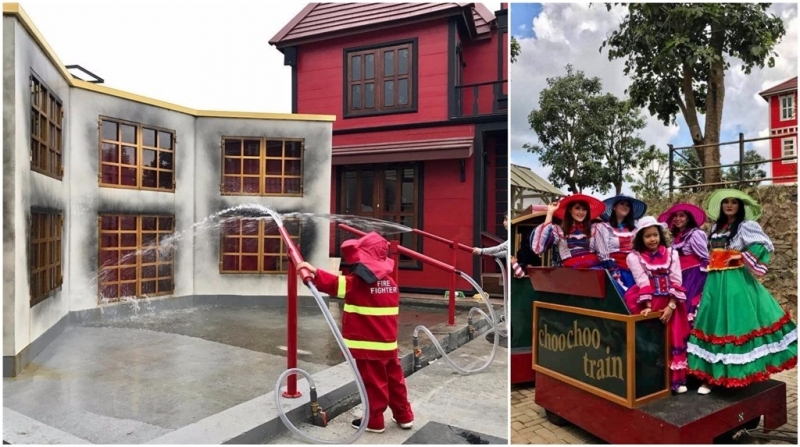 Girls can also be town residents by putting on Holland-inspired dresses available for rental (IDR 75,000 / ~S$7.60 per hour) from the first red house near the entrance. An epic #OOTD? Check! Remember the teddy bear house we mentioned earlier? Say hello to teddy bear paradise! The Bear House is filled with all kinds of stuffed teddy bears. If these soft and fluffy bears catch your eye, you’re welcome to take any of them home with you as they’re all up for sale. 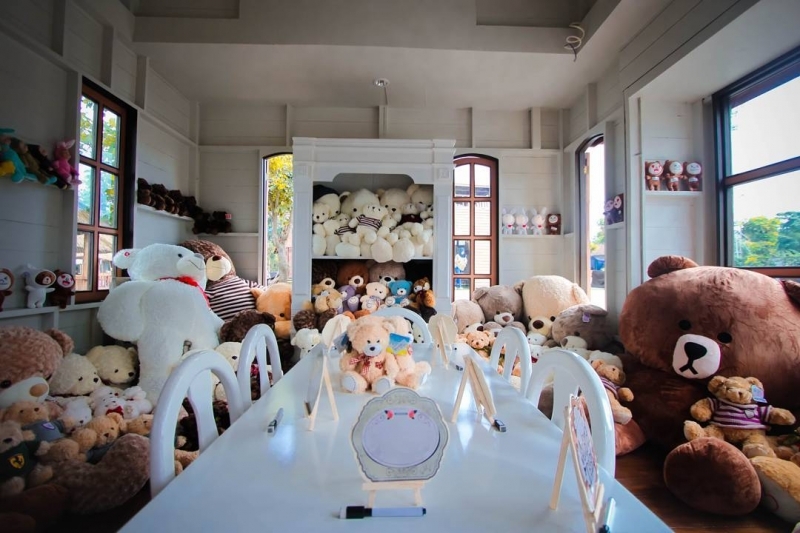 Cost: Entrance to the Bear House is at IDR 25,000 (~S$2.50) per person. Just imagine, a slice of Europe in Indonesia! Visiting Europe no longer has to come with that hefty price tag; now you can fly to Bandung and experience a dose of it for yourself. Book a flight+hotel package with Expedia and enjoy an additional S$40 off – all the more reason to embark on your next weekend getaway! 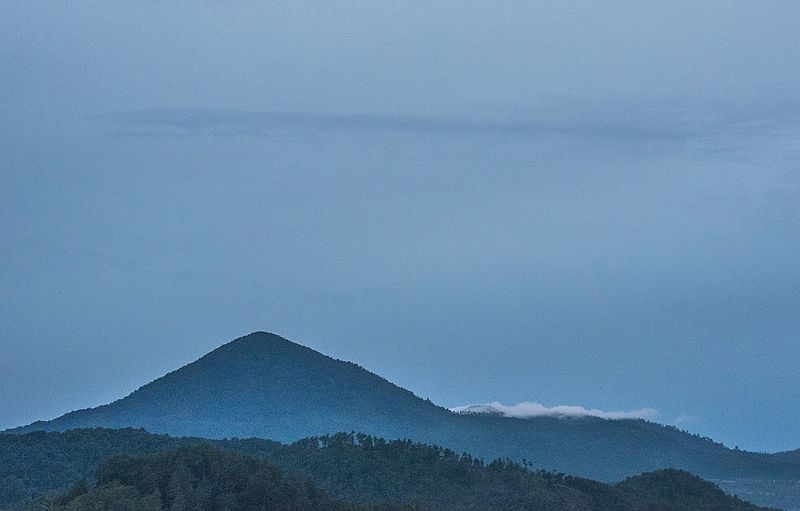 Though not as popular as the well-known Tangkuban Perahu, Gunung Putri’s beauty should not be overlooked. Located in Lembang, one hour’s drive away from central Bandung, it provides you with a refreshing change of scenery should you desperately need a break from the hustle and bustle of city life. Cost: For entry to Gunung Putri, each visitor will be charged IDR 5,000 (~S$0.50) at the main gate located at Jayagiri Street. 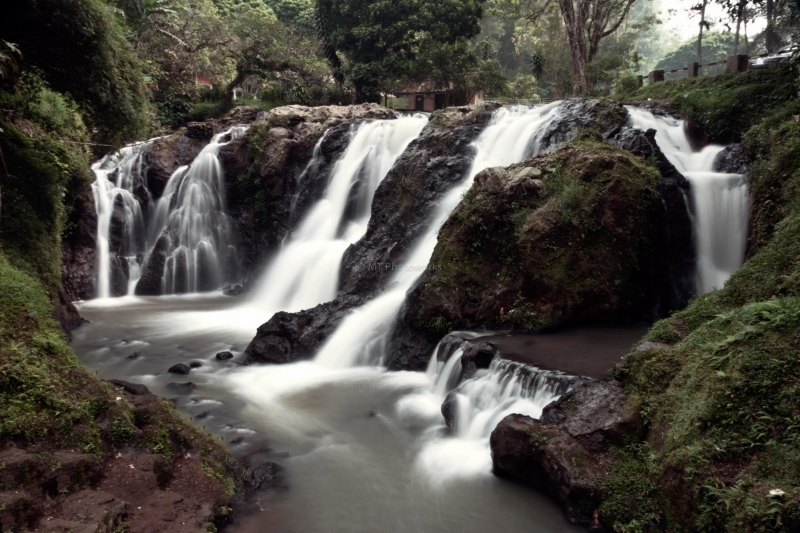 Another one of Bandung’s stunning natural landscapes, Maribaya Waterfall (Curug Maribaya) can be found in Lembang. Situated among the dense vegetation of the forest, it is a great place to make a stop at if you desire some peace and quiet. Stand back (or take a seat because you might be here for a while!) and let the sound of the water crashing at the base of the waterfall, coupled with the symphony of the forest’s inhabitants, soothe your nerves. Let your worries float away as you bask in the magnificence of the waterfall. Cost: To get to Maribaya Waterfall, each visitor has to pay IRD 8,000 (~S$0.80) for an entry ticket. If you’re going there by car, an additional fee of IRD 4,500 (~S$0.45) will be charged for parking. For those who are seeking something extra, there are also hot springs that are accessible to the public. You can use these hot springs at IDR 5,500 (~S$0.55) per adult and IDR 2,500 (~S$0.25) per child. And of course, the famous Tangkuban Perahu has to be on this list! Also located in Lembang, this volcanic mountain’s hotspot is its crater, which is constantly emitting sulfur – excellent for taking photos that will certainly grant you bragging rights among your friends! To refresh your soul from the stress of your hectic days, spend some time away from the city up here in the mountains. Inhale the cool mountain air, take in the captivating scene that nature has to offer and let all your worries melt away. Cost: If you’re planning to make a trip here, you might want to come on a weekday (IDR 200,000 / ~S$20.20 per person) as entrance fees are more expensive if you visit on a weekend (IDR 300,000 / ~S$30.30 per person). 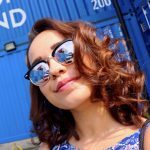 For those seeking an offbeat experience, Bandung has a wide variety of unique accommodations that put the usual hotels to shame. Rather than settling for yet another plain vanilla stay, here are some cool alternatives you can check out for a vacation that everyone will remember. 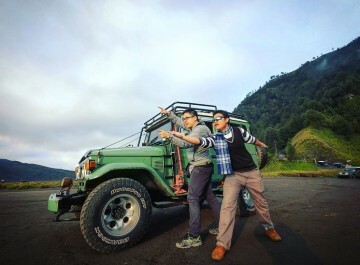 This quirky camping accommodation is located outside Bandung city, known as The Lodge Maribaya! If you’re worried about it being uncomfortable, don’t let the word “camping” deter you. These pumpkin-shaped tents are furnished with mattresses, blankets and pillows. There is also a fan, an internal light source, power supply and a power socket for you to charge your devices. These tents has room for up to four people, with extra space to store your bags and other items. Here’s something more to convince you to stay at The Lodge Maribaya: the breathtaking scenery that surrounds the area, Mountains, pine tree forests and the Maribaya waterfall, among many other sights, are just waiting for you to discover. 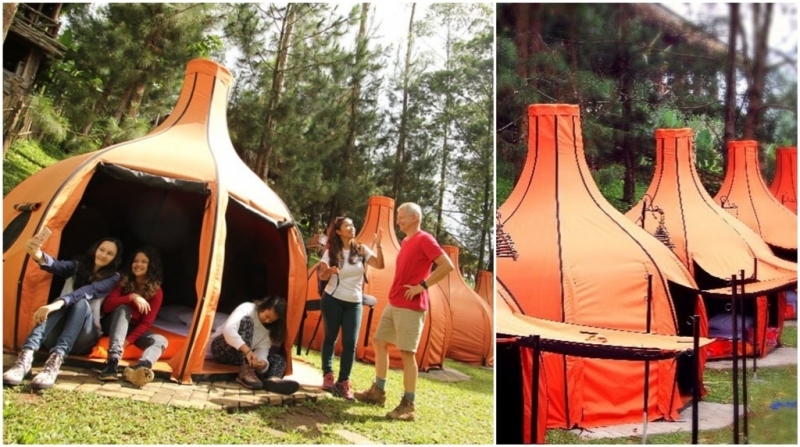 Cost: If these unconventional bright orange tents caught your attention, you’ll be able to stay in one starting from IDR 603,750 (~S$61) per night. This fee is inclusive of the entrance fee, breakfast, dinner and a welcome drink. If you’re a hopeless animal lover, Kampung Cai Ranca Upas will be your paradise. 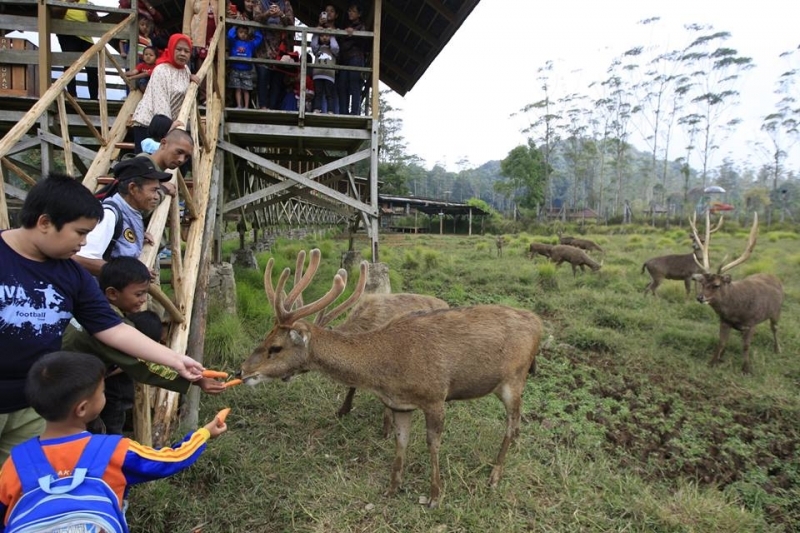 Here in the outskirts of Bandung, you’ll find a deer farm where you can feed the resident deer with carrots and leaves. Watch the deer adorably munch on the carrots while you enjoy the cool weather and breathe in the crisp air. The ground near the feeding area might be muddy, but do not worry! You can choose to rent or buy boots to put your mind at ease. And yes, you can even stay amongst these free-roaming deer! Apart from the deer farm, you can also take a hike around the area to explore and indulge in its beauty. Cost: Entrance fee to Kampung Cai Ranca Upas is at IDR 10,000 (~S$1) per person. Remember to bring your own camping equipment if you’re planning to stay the night as they do charge if you want to use theirs! If you’re the kind of traveller who still wants to enjoy the creature comforts of staying in a hotel, Stevie G Hotel located in Lembang is just what you need. The 24 rooms in the hotel are all designed differently with creative names; take your pick from ‘Transylvania’, ‘Space Pop’, ‘Picnic at the Green Grass’, or ‘Alice is Lost’, among others. Conveniently surrounded by many restaurants, sightseeing locations and shopping districts, this hotel epitomises the meaning of comfort, but with a delightful twist. Cost: Stay in your favourite one from the many options they have available, starting from just S$40 a night. Next stop: Bandung! If Bandung has never crossed your mind as a holiday destination before, we feel that it’s about time to have it on your list. 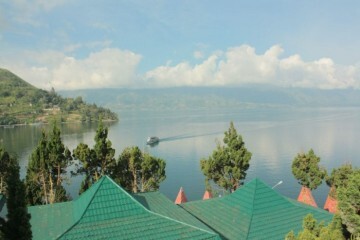 Though lesser known, there’s much about this place that makes it one of Indonesia’s true hidden gems. Book a flight+hotel package from Expedia and receive an additional S$40 off your booking or, if you’ve already settled your flights, enjoy an additional 10% off your hotel reservations. For more information and trip inspiration, bookmark the My Great Escape campaign that’s happening from now to 8 November 2017. Are you ready for your next adventure? Start planning your trip to Bandung now and you’ll be all set for an incredible trip! Brought to you by the Changi Airport Group. Brenda loves to travel and explore. She wishes to travel the world and experience living like a local as much as she can. New experiences and unfamiliar places excite her, and writing about them gives her great joy. 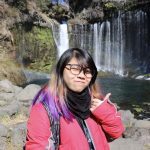 When she’s not going on an adventure or daydreaming about exploring the world, she enjoys binge-watching Taiwan dramas, reading, going to gigs and jamming out to punk rock music.